On February 9, 2017 the third floor atrium of Akron Children’s Hospital became a world of magic for three straight days during their annual Radiothon event. Balloon bouquets, columns and arches created a festive environment, completed with a craft table, raffle gifts, and a photo booth for all. Phone banks buzzed with activity. Cow bells shook in the air with celebratory cheers for each pledged donation. Change Bandits arrived, challenged with carrying various cases of change – each weighing them down. United Networks of America regional representative, Leigh Smallfield was also actively engaged in the event, representing the Ohio Drug Card program. 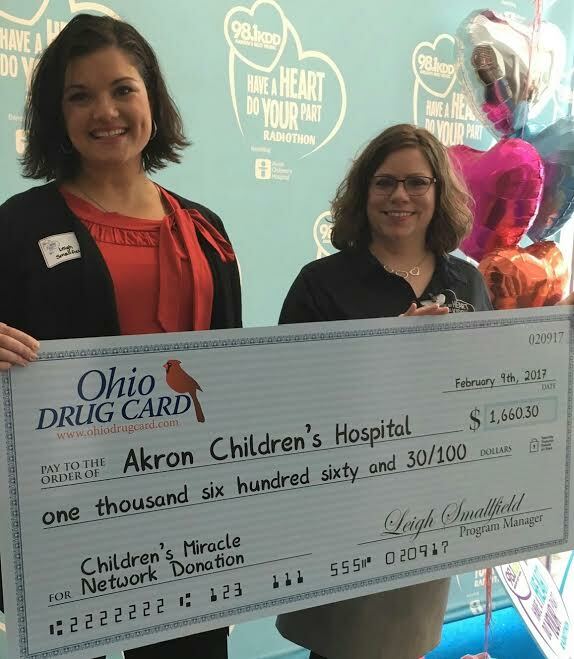 Joining forces with Change Bandits, phone bank pledges and more, the Ohio Drug Card program presented a check for $1660.30 to Akron Children’s Hospital, contributing to a final total of over $550,000 raised during 36-hours. United Networks of America, is one of the largest providers of value-added managed care products and services in the country. Funds are raised through the UNA RX Card program. More information about UNA and the Ohio Drug Card can be found here.